All right...apparently people are quite offended by my allegation that my oatmeal cookies are more delicious than chocolate chip cookies. Let me just say that they totally are if you are me and prefer the moistulous oatmealization that they bring to my tummy. That said, I do take my chocolate chip cookies quite seriously. I've spent many years trying different recipes in an attempt to find a recipe that produces soft and moist cookies every time, ones that freeze well and keep for many days. Then, my college roommate gave me her recipe. I adjusted it just a bit for the lower altitude. If you are baking these in a higher altitude, reduce the flour to 3-1/8 c. and add just a bit more brown sugar. Cream together your shortening, sugars, and vanilla. Beat in eggs. Add dry ingredients and mix well. Add chocolate chips and mix. Drop in teaspoonfuls onto a greased cookie sheet and bake at 350 degrees until very slightly brown. I find that it's quite important to use an entire bag of chocolate chips, and not just a cup or two. 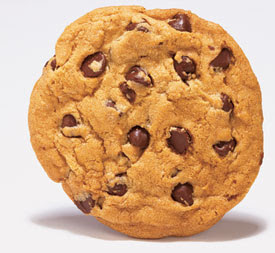 And I also like a good quality chocolate chip, like Ghirardelli semi-sweet chips or Hersheys. You can also use M&Ms or crumble bits of your favorite solid chocolate bar if that's what floats your boat.